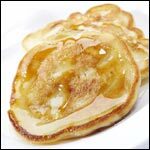 This recipe for Pancakes was submitted by CurtAndMary on 9/28/2004. Click here to view the recipe. How do you pronounce Nalesniki? Nah Lish Nike? I have loved them since was kid... with raspberry preserves and whipped cream. Grandkids like fresh strawberries. When my son was very young, he pronounced them as 'plaszki' and it stuck, so now all my grandkids call it that too. 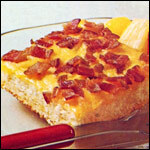 Frankie Jones wrote, 'It is not a crepe, it is a nalesniki.' My response: Actually, it is a 'nalesnik' which is the singular for the plural, 'nalesniki.' 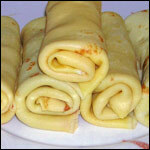 So you would say, they are not crepes, they ARE nalesniki; or, it is not a crepe, it IS a nalesnik! Hey! Thin is good. What is it people do not get about Polish Pancakes? Very similar to my Babci's recipe. The only difference is she didn't use any water and she used a full cup of flour. Otherwise it's exactly the same. Good stuff! Thank you so much for this recipe! This is the same as the Latvian cottage cheese pancakes (biezpiena pankukas) and I've not been able to find a good recipe for them. This recipe is excellent! This is the first traditional polish pancake recipe that even comes close to my great grandmother's. It is true that it is a more watery batter than a French crepe but it is supposed to be a very thin and very delicate "pancake". Our family begs for nalisniki's on special occasions. It does take a little bit to get the pan just the right heat and to get the hang of doing two pans at the same time. But as with the Polish style we have come to consider it a "growing up" kind of thing. Once you can accomplish it you are a true grown up! It is not a crepe it is a nalisniki. After reading some of the comments that it needed more flour, I decided to use Ann Marie's crepe recipe in the comments. It worked really well. The filling - which I did not modify - was good without changes. Next time, I might add some crushed pineapple or some jam into the filling to make it even better. The batter was very, very thin so I added about 1/3 cup more of flour... also a Tablespoon of canola oil (based on a note I read here). After those changes, it turned out nice. Add 1/3 cup more flour and fill with apple sauce mixed with a couple dashes of cinnamon... delicious no matter what you call it. The batter was much too watery. I couldn't even bake a single good one. You need more flour and some sugar, and Olga, your right, it's much better with 3 tbs. of oil. Sift together dry ingredients, beat eggs well, slowly stir in milk then eggs and other ing. Heat griddle to 375. When edges all around pancake turn dark yellow flip, count to 10, and remove! This recipe needs more flour. Also, it is much easier to add 3 tablesppons of oil to the batter, and then fry nalesniki on dry Teflon pan. And use "dry cottage cheese" (they have it at Jewel), otherwise the filing is too runny. Fry pancakes on oil not butter. Reduce milk b/c milk burns on the pan. Nalesniki-- at my house they were served only for breakfast if they were left over from dinner. They're good any time of the day, though. Fillings were either jam or the above sweet cheese filling. I'm echoing everyone else here in saying that the amount of flour is too small; should be 1 cup. Or cut the milk to 3/4 cup. Cheese filling: spend a couple of dollars extra, and buy farmer cheese instead of cottage cheese. Cottage cheese is not used in Poland, and it makes for a lousy substitute. A few tips for the batter: my whole family (mom, grandma, aunts) made the batter without egg whites. The batter was allowed to stand for 30 minutes, then egg whites were beaten until stiff peaks formed, gently incorporated into the batter, and then fried. This always made for much fluffier nalesniki. Nalesniki are awesome any time of the day, but this recipe is not. I followed step by step rule and I end up with a mess. Why? Need to add more flour! Another thing, put 3 tablespoon of batter to the pan.... no comments to that. I tried that to, and again, a mess. From 6 suggested serving I ended up with one and half, largely thanks to the errors in recipe. Lastly, those are called Nalesniki, not malesniki like someone else named it. Nalesniki are delicious. I don't know how to make them, but my mother make them so good that every time I go visit her in New York, Nalesniki must be on the table. Darek from San Antonio, TX. I am a Polak living in Texas since 1995. Love Nalesniki especially with the cheese filling, but if you are in need of something for your sweet tooth try Nutella (Haselnut Chocolate Bread Spread) as a filling. Bardzo smaczne (very delicious)! Btw, I'm Polish, and we call them "Naleśniki". Dobra! Wonderful recipe. These are meant to be a thin and delicate crepes, not American flapjacks. 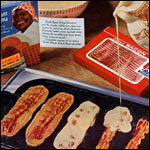 Make certain you roll the batter around the frying pan to spread it evenly. I love em. These are the pancakes my mother and grandmother always made. I was surprised when I ordered pancakes in a restaurant and a thick, floury hotcake was served. 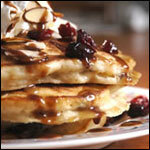 Try these thin pancakes with butter and real maple syrup. Delicious! I'm the second generation polish-american decent and I make Nalesniki for an anytime dish morning, noon or night... (sometimes even midnight!) They are great with all different types of fillings Strawberries, Rasberries, Apple, and Cheese... Eat them with a little bit of Sour Cream and you have a great dish! Just to add a little something, you can use the butter pam in the dish instead of the butter its better for those artery clogging calories! I currently live in Poland. Nalesniki are delicious any time of the day. My mother-in-law often serves them for dinner! Definitely add more flour. I have been taught to fold them into quarters like a French crepe, then add the filling and put them in a buttered pan to heat again. This takes less time than 30 min in the oven. They are very good with sour cream and freshy crushed raspberries. I remember my mom always making "Nalesniki's"- the best part was spreading a little jelly like strawberry or red rasp.,on them and then rolling them up! The (person) who submitted this recipe should be sent back to school. Number one: calling them "pancakes" is very misleading; think more of pan made "tortillas". Number two: you''ll need more like 2 cups of flower then 1/2 - if this were a bomb making recipe, the user would be injured by now. And forget about the water; 3 tbsp isn''t going to make jack of a difference. No comments on the filling. Definitely agree with the "a bit more flour helps this recipe" comment. App. 1/3 to a 1/2 cup more is needed, otherwise they don't cook well and turn into a disaster instead of one of the most enjoyable Polish dessert dishes. Polish pancakes are definitely called Nalesniki not Malesniki and these are the best!!! I am from Polish descent and saw your Nalesniki (Polish pancakes) online. Don't know where they got the name from. We always called them Malesniki. A bit more flour helps this recipe. After they are cooked, they are good with apple sauce. All you need to know. The basics and beyond! Click here.